I’m not quite sure what I want to blog about tonight but I haven’t blogged since March 8th. 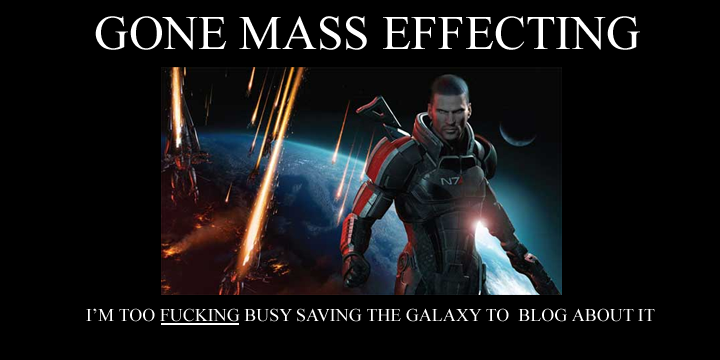 So I decided on another Mass Effect 3-related post. I’m pleased to announce that I beat Mass Effect 3 on the Normal Difficulty within sixty-four hours. I like to explore the world/universe as much as I can take in. I like to absorb all the information available. Out of the series, 3 has to have one of my favourite Citadels. I would rate it as a close second after the one in Mass Effect that started it all. I absolutely hated the layout in the second title. It just didn’t do it for me. I was actually expecting the way 3 ended. I’m annoyed by the massive outcry of fans that are dissatisfied with their final result. BioWare did come out with the announcement of 2 that the third will be the final Commander Shepherd story. So the hero, the champion dies at the end. In what tragedy does our champion survive? I admire the hard work level designers and story developers have placed into this franchise. They have developed an open universe for gamers like you and I to explore. However, the community seems to be unthankful for these people’s commitment into bringing excellent video games for us to play. For example, Metacritic users posted negative reviews and shared them on Reddit. They put thousands of hours into this game and are completely dedicated. Hell, I want to give game developers a hug but I don’t want to come across as creepy. Y’know what I mean! I admire that BioWare has stated that they’ll release Downloadable Content (DLC) in the future that’ll shed some light and, or change the ending. They care about feedback from fans. However, I don’t think fans are always right. Video game design is an art form. We must respect these artists for their work.